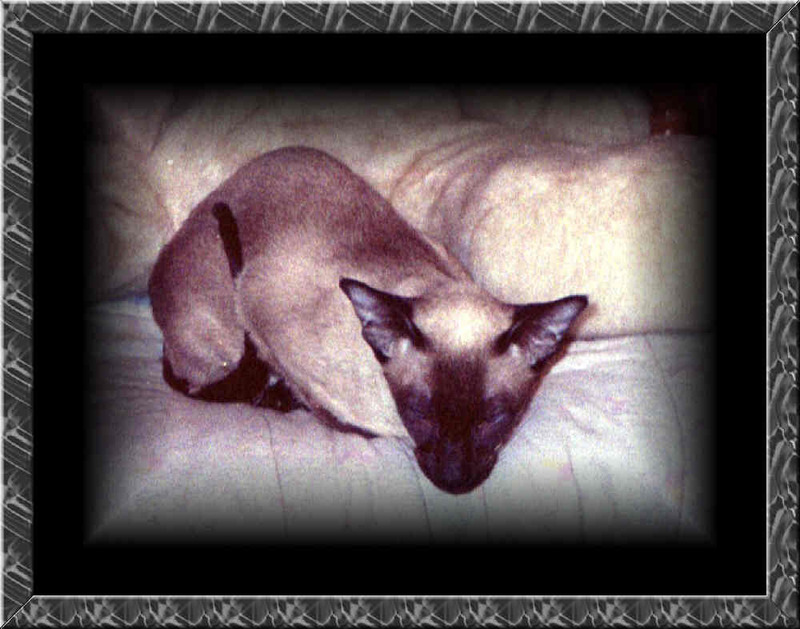 I have lost my best friend and bosom buddy of 22 years, Joan Green (Osanh Siamese) who passed away in the early hours of Friday, February 8, 2008. Joan taught me all I know about the Cat Fancy. If it weren't for her, I would not be breeding today. On Dec 21, 2007 she was rushed to hospital and diagnosed with pneumonia, released on Dec 24th, only to be returned on Christmas day. She was told she had an aortic aneurysm (Thoracic from the angiography taken) and had a 50/50 chance to survive the surgery which she refused. She was released on Jan 7 and again rushed back to hopsital on Jan 18th due to severe pains. She had problems eating and had lost so much weight. She was told she contracted a super bug (seems to be going around all hospitals these days with so many different strains that antibiotics can't seem to catch in time or cure) that spread to her kidneys and liver and finally her brain. (I personally felt that her health was slowly deteriorating after the house fire since her spark seemed to be fading.) She had never been sick in all the years I knew her. She was so active, full of energy, always looking ahead & taking one day at a time that I had a hard time keeping up with her. 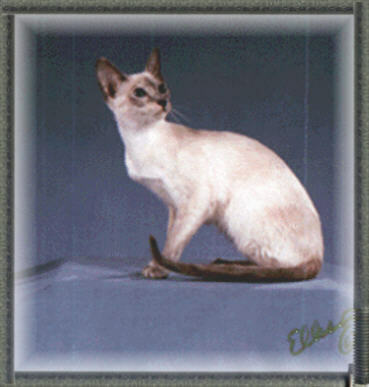 While home for this short period, she did see 2 of our queens give birth to Siamese and Oriental kittens. Our other 2 queens gave birth on January 30, 2008 while she was hospitalized. She was pleased about these litters and was looking forward to finally getting our breeding program off the ground and moving into the new home which has been under construction since September. Unfortunately, Joan will be there only in spirit. We thank all of you that have helped us get through the house fire. Purrs to signal "All is well"
small wonder why we love them so. Unfortunatley, cats can't live forever, and die of similar health complications just like people. The good Lord decides their longevity as He does with us, His children. It is our responsibility to make sure that we don't keep them alive just to nurture our own grief, as we MUST NOT let them suffer any unnecessary pain. - the BEST male I have ever owned! 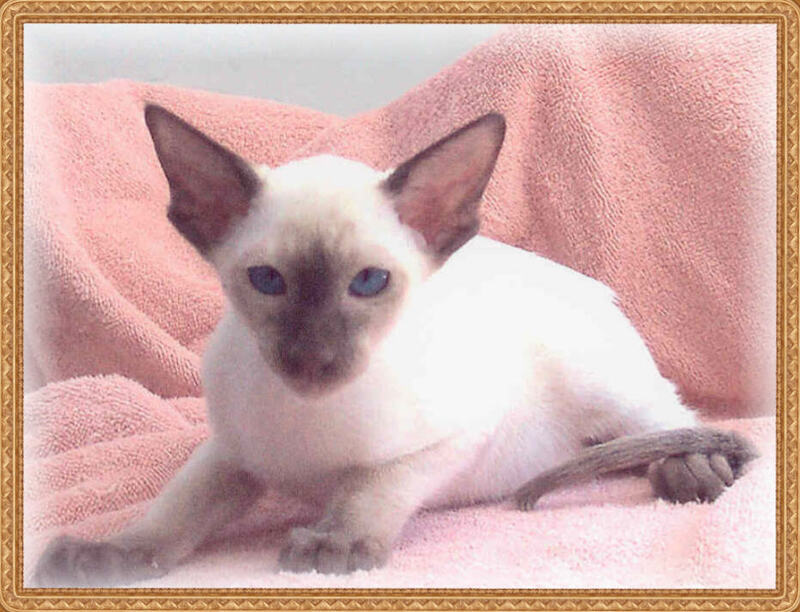 He sired some of my Grand Champions (GC): chocolate point female GC Shocho Victoria of Osanh, chocolate point male GC Shocho's Shadow, and red point male GC Shocho's Nijinski. Although it took Dusty almost two years before he realized he was a stud male (too busy loving the show circuit) all of his progeny (kids) have inherited his great temperament. He is greatly missed! Thank you Lois for this beautiful boy. Angel came to me when she was 3 years old and was the most affectionate female I have ever owned. I never had the opportunity to have any kittens from Angel despite my Veterinarian telling me she was healthy as there were no signs of poor health. She would conceive, then half way through the pregnancies, re-absorb. She always talked and purred. She was still eating, drinking and walking around until the last 24 hours, then - she was silent. That's when I knew something was wrong. Her necropsy confirmed she died of kidney cancer. Crystal Angel will never be forgotten! Sire: Shocho's Mio Mauve Dam: Shocho's Angel Born: Sep 15, 1998 Died: Feb 24, 2005 Call Name: "Missi Moo Moo"
Mission had one of the most unique personalties anybody could expect from a cat. She was so friendly, trusting and greeting everybody that came through our doors. She has passed this trademark on to all her kittens. Despite her failing kidneys, she never showed any dispair with her fluid treatments. She had always favoured my husband and was his special cat. Now she can share Heaven with him forever. Sire:(CH) Shocho's Titan Dam: Shocho's Choclat Kisses Born: Sep 24, 2000 Died: Feb 27, 2005 Call Name: "Bugsie"
Ladybug died of surgical complications two days after being spayed. She was a very special Lady, and the only whole offspring carrying Choclat Kisses' lineage. Ladybug had no surviving offspring. Read her full story HERE! Sire:(CH) Koblizek's Dakotah Dam: Koblizek's Petite Bopeep Born: Dec 10, 2001 Died: Feb 17, 2006 Call Name: "Chockie"
Another beautiful cat lost to this horrific disease called CANCER! Chocolateer was far too young to die of lymphoma sarcoma (numerous cancer tumors causing his liver to completely shut down) without any early visible signs. Cats are fastidious at hiding their ailments until it is too late. I want to thank the Vets and staff at Glenn Mountain Animal Hospital (Visit Here!) for taking such great care of him during his final days. It was just as hard for Dr. Benipal as for me while I held Chocolateer in my arms for his journey to Rainbow Heaven. He was a very gentle quiet stud that loved to eat and weighed in at 12 lbs (before putting him on maintenance food like my old Starduster). He was the greatest for novice queens! He never held them with his teeth - just did the job and immediately backed off. His method was very unique. Fortunately, there are females in the breeding program to carry on his lineage, but he'll still be terribly missed since he was the only male chocolate point. Koblizek bloodlines are so well known for that fabulous personality, especially in her males. So, again I say thank you Lois for my second best male, and some day, I'll be back to get another "Great" one from you. It has been just over two months since our home was totally destroyed by fire on Nov 28, 2006. We lost all but 2 of the cats and kittens in our breeding program. 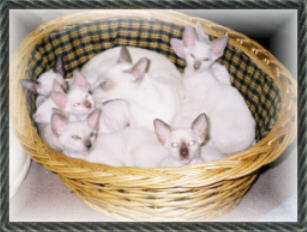 Osanh Canadian Sunshine, call name Chief, a 15 year old spayed chocolate point (Starduster's daughter) and 11 year old Shocho's Barvarien Cream, call name Pink and the only cream point male and grandson to Jewel, are the only survivors along with the dog Casper. Material things can be replaced, but these special babies cannot. Praise the Lord, we had moved a few cats to the cottage last year where we have high speed cable internet. So from these, we will rebuild our catteries in due time. Although most of these cats are ready for retirement, strange to say, they carry all the lines we lost. It is very difficult to talk about this loss, and thank everyone who has been very kind in giving us clothes etc. and sending us their prayers. It is a new year, the beginning of a new cycle where life goes on and can only get better. God bless our special friends! Please monitor your pets for any changes in their health. 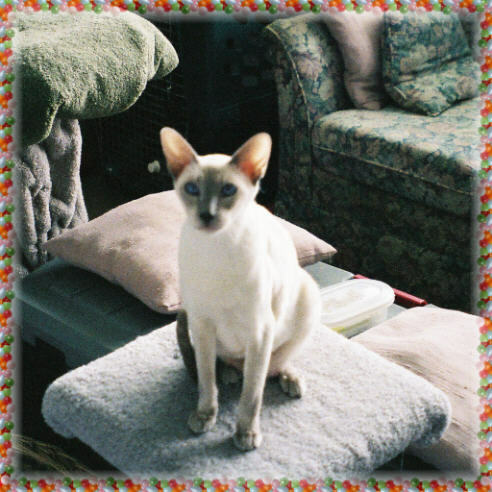 Siamese and Orientals do not always show any symptoms until it is almost too late! Animal lovers are gentle, caring people - the kindness we share returns in countless little joys to warm our hearts with the birth of each new kitten.